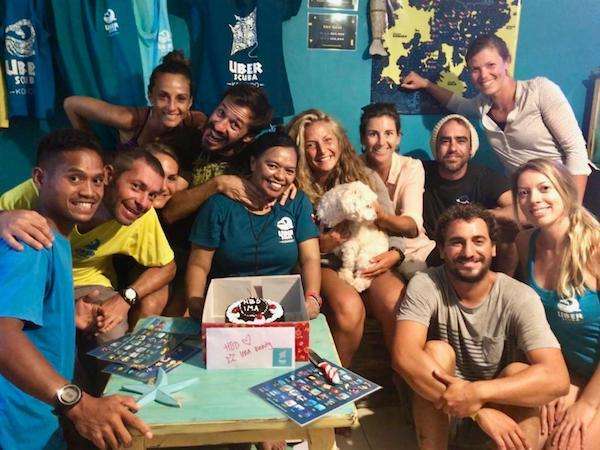 The Uber Scuba family is a blend of Indonesian and international talented professionals who are united together to share their passion for diving, the ocean and the environment. 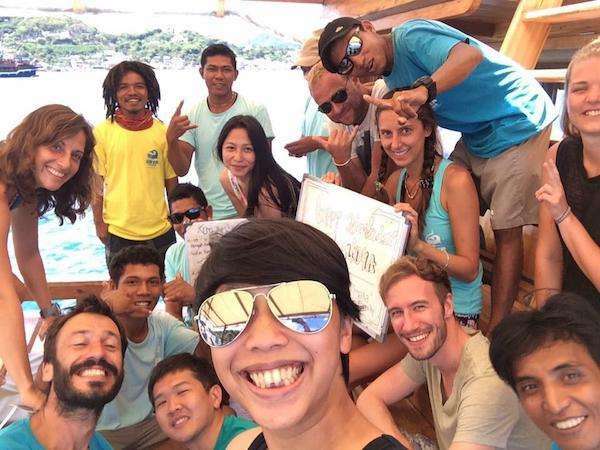 Founded in 2015 by Welsh lady, Clare, and German stein-wielding, Michael who after living, diving and falling in love with Komodo over the years dreamed of starting their own company offering the kind of overall experience they were craving; epic diving, comfortable boats, friendly staff, freshly cooked, hot meals, and top notch customer service amongst the rest. 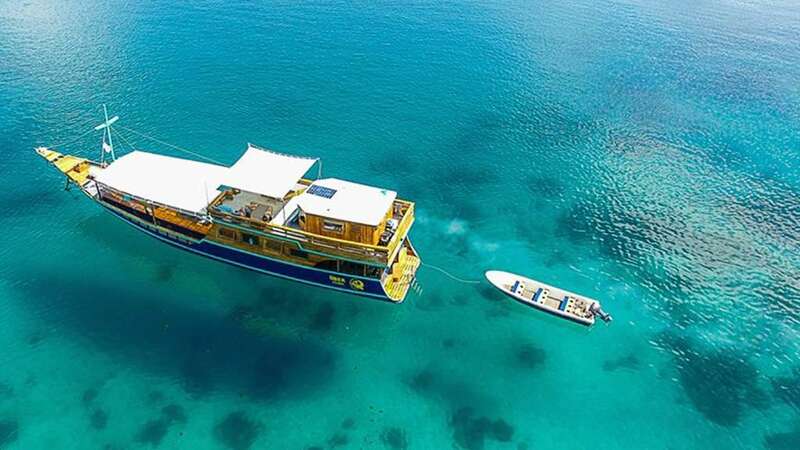 After bringing this dream to life, they were later joined by Swedish Fika-loving couple, Pablo and Jessika, who took over the management of Uber Scuba Komodo, plus Spanish hombre Jorge and Italian bella Cristina who helped to grow the Uber Scuba fleet by introducing our beautiful Komodo focused boutique liveaboard KLM Amalia. Together, they scouted the best team you could wish for. 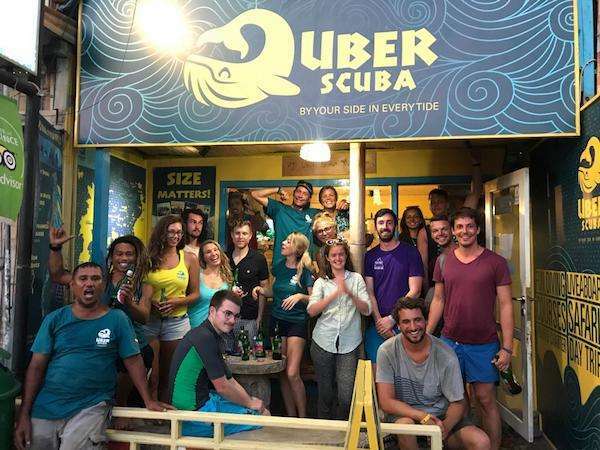 Our multi-national and multi-lingual team are truly the pick of the crop, making up the super fun, loveable and talented Uber Scuba family that it is. We have no doubt that you will instantly feel like a part of our family and find your home away from home. We’re waiting to welcome you to paradise and experience the magic Komodo and Uber Scuba are blessed with. The name Uber Scuba was chosen due to the connotations of excellence and German variant of ‘Above’. 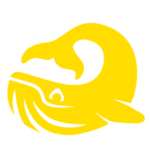 Add in a whale for our logo as Clare is from Wales. We wanted to ensure a part of us was always By Your Side in Every Tide. Our Boats have been built especially for our Labuan Bajo dive center, and are all old cargo ships which have been stripped to their ironwood hulls. Later rebuilt by our team of Sulawesi woodworkers to ensure solid, long-lasting quality. All of our boats are outfitted with the most modern and reliable GPS, VHF radio equipment, emergency oxygen, lifejackets and first aid supplies. There is plenty of shaded deck area on all of our boats and space for your bags. We even bring a speedboat with our day boat KLM Iona and liveaboard KLM Amalia for added flexibility and safety. We are proud to say that we are the only day trip operator to offer this – safety first! Have you read any scary stories about the currents in the area? Have no fear! It’s a big part of the reason why the diving in Komodo regularly rates as some of the best in the world. Did you know that safety always comes first when you dive with us? There are plenty of calm and sheltered areas where we can introduce you to our seas. Perhaps through a discover scuba dive experience or get certified with an open water course. Komodo offers us abundant sites in which we can teach you how to use currents to your advantage when scuba diving, perhaps put this to the test and enjoy how to handle current in your advanced course. Our team has worked these waters for years. They have learned to read the skies and the sea, and your safety is our top priority. We’ll get you in and out of your gear in record time. We’ll provide you with freshly prepared meals, and cold drinks in the cooler. Our professional crew is always willing to help you with whatever you need. Whether you’re in the water or waiting to dive in! Our rental gear is Scuba Pro and Mares equipment that is regularly, and rigorously inspected. Many sizes are available for both men and women. Non-divers are welcome to join any of our excursions, if, with a scuba diving partner. We offer a variety of packages that will save you a considerable sum if you are planning to do multiple dives. Sign up for one of our daily dive trip packages “Into the Blue”, or “Manta Madness” or if your non-committal, give us a shot and join a simple single day – “Day Tripping” includes 3 dives in one day. Though we are 100% confident you won’t quit after just 3 dives! You will have only scratched the surface of the Komodo underwater experience. 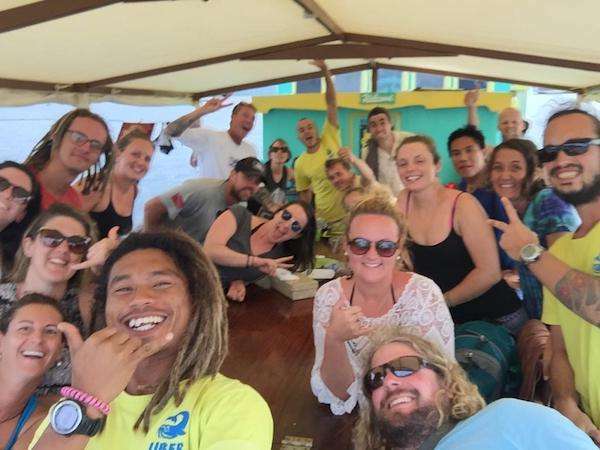 If you have not yet got your diving licence, we can offer a range of courses from try diving, open water course, advanced adventurer up to dive professional level – with our experienced and multilingual instructor team. We also regularly run excursions to see the Komodo Dragons of Rinca and 2 dives. Check our prices page for details and email us now for availability. If you are looking for a Labuan Bajo based dive center package that accommodates your diving, sleeping and eating needs – join us on KLM Amalia, our stunning Komodo liveaboard for 3, 4, 5 or 6 nights of diving delight. 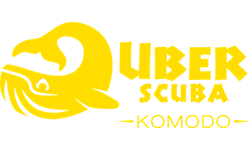 We are a proud member of the Labuan Bajo dive center community D.O.C.K (Dive Operators Community Komodo). 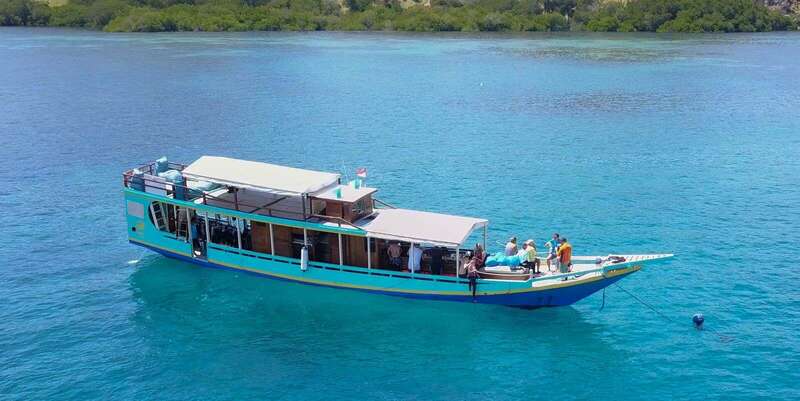 We advocate commitment to safety, fair treatment of staff, regularly maintained equipment and boats, and conservation within the Komodo National Park. Maybe you’re not getting the whole story. You’ll have to come to visit and get to know us. It’s the only way we’ll tell you (almost) everything! Got concerns, questions, or doubts? Contact us at any time and we’ll put your mind to rest. We are delighted to answer your questions, and even offer you advice on transportation and accommodation during your stay. Iona is 24 meters long by 4 meters wide. Named after Clare’s mum, Iona derives from an Old Norse name and means ‘island.’ With a strong and sturdy hull, made from Iron Wood (Kayu Ulin) derived from Kalimantan. An old live-fish bait vessel, we have completely renovated Iona to our detailed specifications with our team of woodworkers from Bira, Sulawesi. 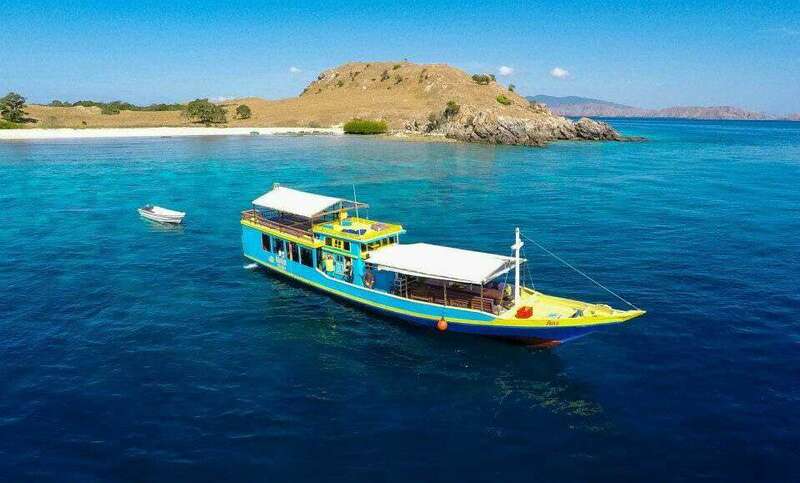 A large dive deck, toilet and shower area, large shaded upper deck, and main deck dining area is featured – you can be assured of plenty of room to stretch your legs and enjoy the ride to the dive sites of Komodo. Chef gets his own space to cook delicious hot meals, and the crew have a comfortable cabin area which also houses our emergency O2, first aid kit and provides plenty of storage. With a 6 cylinder Mitsubishi engine and cruising at a comfortable 9 knots – Iona will get you where you want to be, in style and comfort. Karina is a strong a sturdy ex-tourist boat, sitting at 20 meters in length and 3 meters wide. She is a little smaller than Iona in size and can accommodate up to 12 guests. Karina also boats a hull made from Iron Wood. She is a bit of a whipper-snapper having the same size engine as Iona – a 6 cylinder Mitsubishi – and easily cruises at a top speed of 11 knots. Amalia is an impressive 29 meters long by 5 meters wide and has 5 sleeping cabins and ample room on deck for our liveaboard excursions. Amalia means ‘industrious’ and derives from the element ‘amal’ meaning ‘work.’ True to her name, this beauty works hard to ensure the perfect cruising experience. Sturdily crafted from Iron Wood (Kayu Ulin) derived from Kalimantan. This old fishing vessel has also been rebuilt by us in Labuan Bajo by our team from Bira and a local boat building project manager Haji Baso. The 5 cabins are made up of 2 x double en-suite, 2 x twin bunk rooms, and 1 x family cabin. A bathroom is shared by the twin and family cabins. Small but perfectly formed with ample storage space, our cabins boast natural ventilation and a fresh nautical theme throughout. An open kitchen, inside saloon and TV area, with outside low dining tables. Upstairs is a sun deck with large day beds which can be slept on at night should our guests enjoy the glitter of stars. All of the crew share 2 x comfortable cabins which also houses our emergency O2, first aid kit and provides plenty of storage. Amalia also boasts a 6 cylinder Mitsubishi engine and cruising at a comfortable 8 knots. Hey! Are you ready to visit us? A professional yet energetic dive shop, centrally located on the beach of Gili Trawangan Island. We offer fun diving for certified divers, scuba courses and a range of accommodation options to suit all budgets. 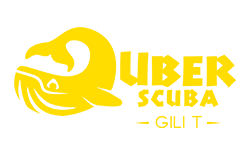 Dive with Uber Scuba to experience the magnificent underwater world of the Gili Islands. 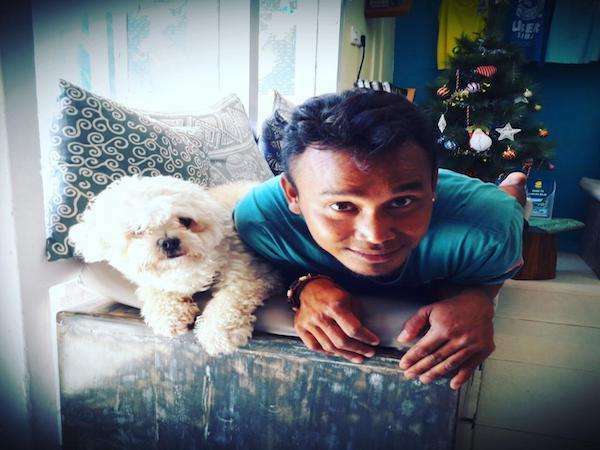 Whether you are a beginner or a pro – trust Uber Scuba as your preferred scuba diving training center in Gili Trawangan. 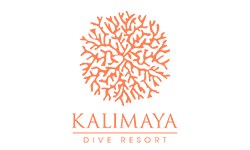 Kalimaya Dive Resort is the first dedicated dive resort in East Sumbawa Island and the only dive operator offering day trip diving to West Komodo, Gili Banta, and Sangeang Volcano. Spend your days underwater enjoying beautiful diving and your evenings with new friends in the restaurant and lounge… or find your own piece of paradise while walking the 400 meter sandy beach of our private bay.